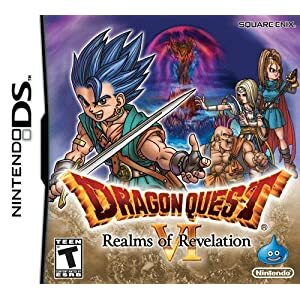 Dragon Quest VI: Realms of Revelation was originally released only in Japan for the Super Nintendo Entertainment System, where it became a best seller with 3.2 million copies. An additional million copies were sold in its DS re-release form in 2010. The US finally got it for the first time ever in 2011 and it concludes the Zenithia trilogy with some story line references from Dragon Quest IV and V.
Like a country road, the story is long, winding and a bit confusing at times. The game starts with you being woken up by your sister and as you begin to explore the world it becomes apparent the real world is connected to a dream world. As you learn to travel between the two it can become confusing as to which one you\'re currently inhabiting. The dream world is being invaded by an overlord and it’s impacting the lives of the people in real life. Surprisingly, the game comes to a mini-climax as you defeat the overlord in the first 9-10 hours. While defeating this boss is a great accomplishment, the world is still not at peace and monsters are still lurking around and growing stronger by the day, leaving you to discover the source of this evil and defeat it. Strong Points: Excellent character development; long game with plenty to do. Weak Points: The story can become incoherent at times and leave the player wondering what to do next. Fortunately, you’re not alone in this battle. For those of you familiar with Dragon Quest V, you\'ll recognize the wagon, and how it allows you to form a party... and gain experience with you, even if they are not in battle. Many of your companions will be found in towns as you explore both worlds. The choices you make in the game determine whether you can recruit them, and even a few monsters can join the cause as well. The Alltrades Abbey, which lets you change the character classes of your party, is also flourishing in the dream world, with lots of classes to choose from as new options are unlocked. There are a lot of classes to choose from and new options get unlocked as you pursue different classes. For example, after a character masters the Priest and Mage classes they can train to be a Sage. My main character mastered Warrior, Martial Arts, Gladiator, and then Hero. With over 370 damage in one strike, the Gigaslash Hero ability is the best in the game in my opinion. 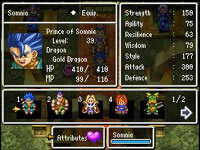 But those new abilities only come through many battles, and Dragon Quest VI plays out like the previous offerings. The random battles are pretty straight forward as you direct your party to attack, defend, use magic, or if you\'ve bitten off more than you can chew, flee. If the enemy you told a person to attack is gone, they will automatically select another monster to attack. When a battle is won, experience, gold, and sometimes a treasure chest is left behind. When enough experience points are accumulated, a character levels up, though attributes and spells are automatically adjusted leaving little room for customization in that regard. The only way you can impact your stats directly is by consuming seeds of magic, life, agility, resilience, and strength. Most weapons increase your attack attribute; however, there are a few that can be used in battle as a tool. Some weapons are cursed, and if you equip them, they may negatively impact your stats. Getting rid of cursed weapons is easier in this game: all you have to do is sell them to a blacksmith. Since you’ll be fighting many hordes of monsters, violence and magic use are a given. Fortunately there is no blood or gore to be seen. Magic is practically unavoidable and along with undead monsters, divination is used by NPCs to guide you in your travels. Along your journey you will see gambling, drinking, sexual innuendos, and some monsters with revealing outfits. I was surprised to see the scantily clad monsters were male. Another surprise was to see the D-word in the game, thus introducing swearing into this series. All of the conversations are text based, so if you can read, you’ll notice it. Many of the same tunes from previous games carry over into this game but there are some original compositions as well. The music is pleasant to listen to and sounds better using headphones instead of the DS speakers. The enemy attacks and spell sound effects are fitting but nothing spectacular. 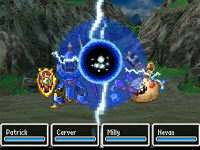 The graphics are similar to those in Dragon Quest V for Nintendo DS. (For its time, the SNES version had amazing graphics.) The towns are colorful and you can rotate the view to get a 3D perspective which is especially handy in dungeons and caves. The battle scenes have unique backdrops and the enemies and their attacks are animated. Although there’s a lot of variety when it comes to enemies and NPC’s, there’s still a fair share of recycling. All of the priests and guards look the same and some enemies only vary by color and stats. Both worlds are pretty big and you can travel via wagon, ship, flying carpet, floating island, or a flying bed. There’s plenty of places to explore and many ways to travel. I put about forty hours into playing through the main quest and haven’t delved in the Dreamscape or Tag mode game features. You can collect Dreamscapes through the game and you can share them with friends and embark on new adventures with different backdrops. Overall this is a worthy addition to the Dragon Quest series and I enjoyed playing it tremendously. My biggest complaints are the introduction of swearing and the sexualization of this title. Game play wise, the story wasn’t as coherent as other DQ games. It definitely lives up to the Teen rating it got from the ESRB.